One of the hottest trends headed our way for spring will be pearls. Embellished coats, bags and denim are just a few of the things we’ll be seeing a lot more of in the next few months! And how can you say no to pearl jeans? After all, denim pants are a go-to for every single one of us, and adding a pearl pair would be an easy way to stay fashion forward without breaking the bank. These NY&Co pair are THE BEST! I love how soft they are too. Currently they’re on sale and under $48! You look amazing! Absolutely love your pearl coat!! Loving the coat. So pretty. 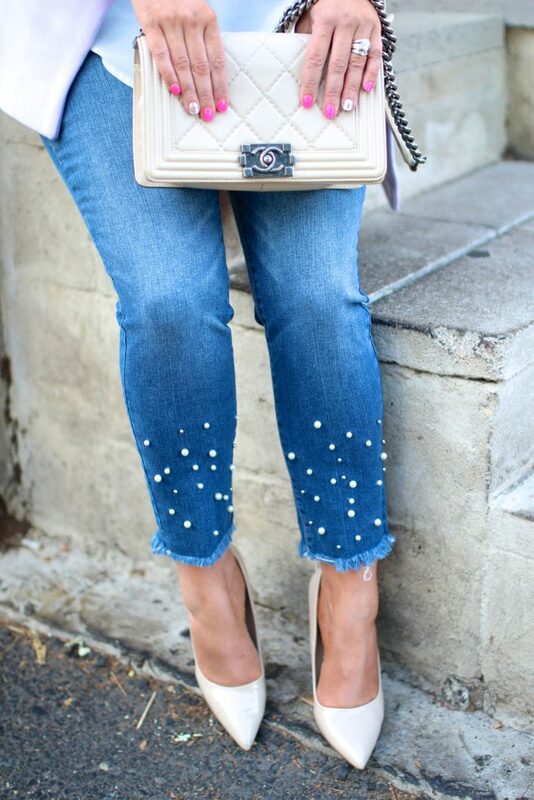 I seriously need a pair of pearl-studded jeans! How fun! SO obsessed with all these pearls! I really love your denim! Twinning with our pearl jeans today! Absolutely in love with this coat, gorgeous!! omgosh all of the pearls are amazing! That coat is such a great color too! Oh those pants are so adorable! I love all the pearl details this season, so fun! I am just loving this pearled/embellished trend… I was at Target yesterday and saw so many pieces, it took everything in me not to load up my cart! LOL! I really love the color of this jacket, so pretty. The denim looks so perfect with it! I love how you went all out with the pearls! Just love the color of your jacket, too. I think I need more lilac in my life! You look so pretty covered in pearls! I definitely need to catch on to this trend. LOVE those jeans! I’ve been wanting to add a pair of denim with pearls to my closet, and I’m loving this pair! I can’t get enough of the pearl trend! Omg so adorable! Love the coat dear. aww those little pearl details are so cute!! Love the dusting of pearls on top and bottom! So pretty! Pearl Perfection. Love your coat and jeans combo and the pearl details are darling. Your manicure polishes off the look beautifully. Pearls can really make basic pieces look fab! And you have really fab pieces here dear. I love the lavender jacket. Such an adorable and chic.